Generally speaking, Eric hasn't really been a baby who likes toys. 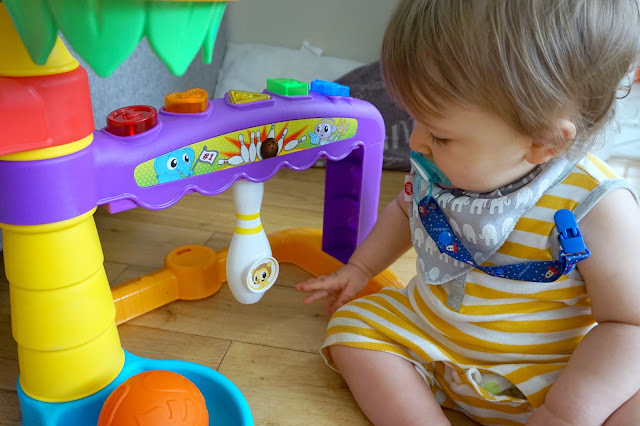 Instead of sitting still for a couple of minutes and playing he has been more inclined to toddle around, items clutched in his hands, or else, investigating how things work. But in the past couple of weeks that seems to have changed a little bit. He now has definite favourites - toys that he will go back to again and again. And the link between them all are ones that are cause and effect. Whether that be a ball, his hopper or his shape sorter, you notice him gravitating towards toys that give him some kind of reward. So as soon as we peeled back the sellotape and opened the box of the Little Tikes Light 'n' Go 3-in-1 Sports Zone* I had a feeling we were on to a winner. Having very kindly been gifted it I couldn't wait to see what Eric made of it. It's one of those toys that you as a parent are secretly wishing your child to love so that you get to play with it too. It looks that good. In terms of putting the Sports Zone together it all seemed pretty simple (Ryan did this bit) with the whole process taking less that twenty minutes. It is quite a wide toy but folds up into a really compact little unit that can easily be tucked out the way (and thus instantly abating my fears that our living room carpet is turning into an ocean of toys). I set up the Sports Zone first thing in the morning and left it sat unassumingly in front of the radiator to see if Eric would notice it. After breakfast we came into the living room and the moment I put E down he bumbled over to the Sports Zone to investigate. 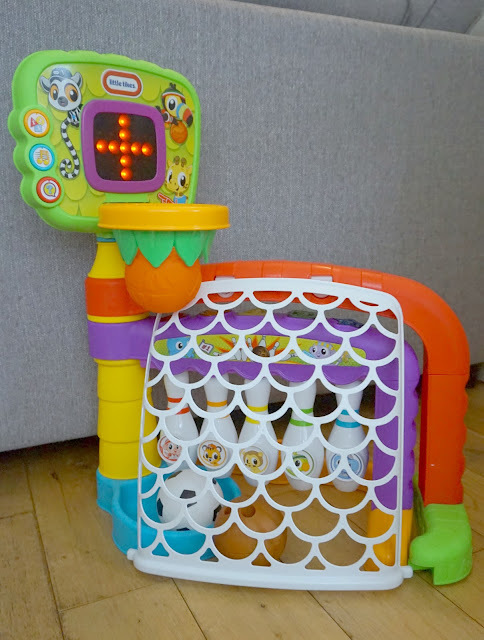 The toy is offers a range of interactive settings, with an electronic scoreboard that lights up, a voice that offers directions or praise and noises that are triggered when you score a goal, hit down bowling pins or get the basketball through the net. There are three different modes for play, which are great for children of a slightly older age who understand words and sentences a lot more or who can be helped by a grown up. However with Eric these went over his head. All he was interested in was directing play for himself. He was very taken with the bowling pins, pushing them all back and making them pop forwards again and again. 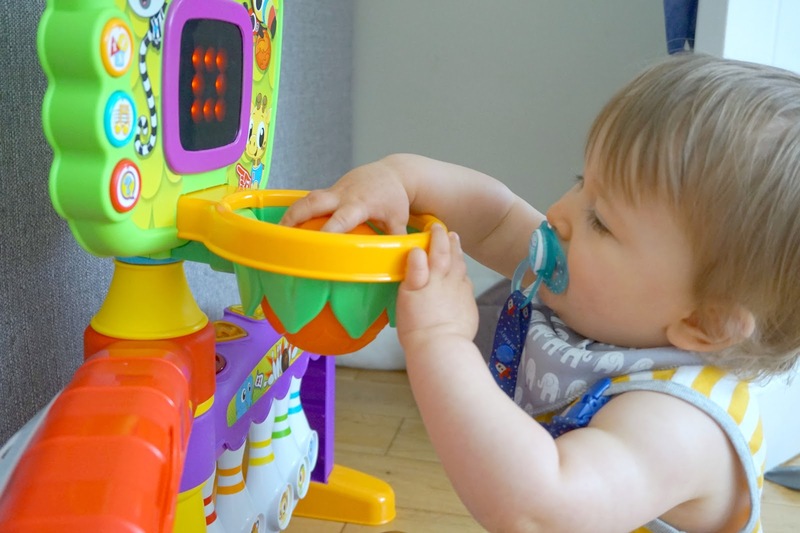 He also liked dropping the basketball through the hoop. The goal he didn't quite get the hang of, but you do have to hit the ball against it at reasonable force for it to register a goal. Throughout the day Eric kept going back to play with the Light 'n' Go 3-in-1 Sports Zone. The squeals of delight and the smiles were endless and he got so excited when the scoreboard lit up and talked to him. Little Tikes have designed something that lets children take full ownership of their play and Eric definitely did that. He didn't really need my help at all. The bowling pins are all reset by pushing large buttons on top of the frame which are easy for little hands to do, and the frame itself folds up and is extended with ease meaning if it was to shift slightly, Eric could manipulate it himself. 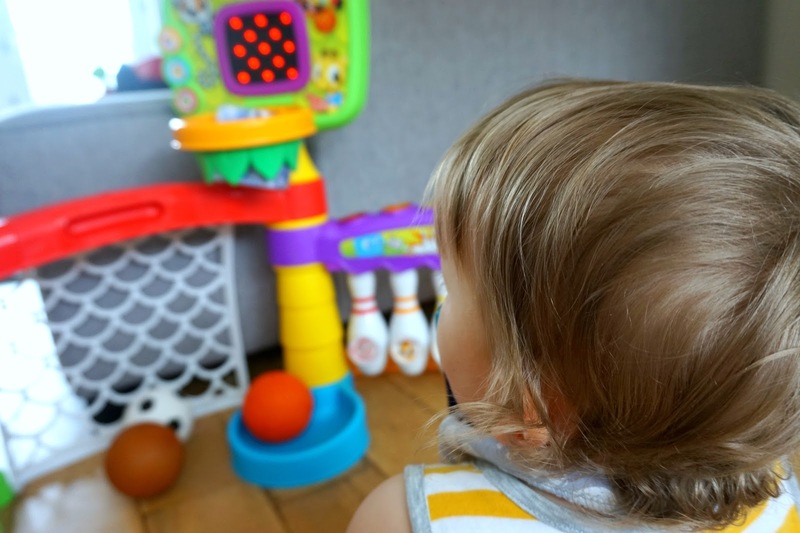 One thing I wanted to mention that I think parents will rejoice upon hearing is that there seems to be a sleep function that kicks in if your child has not interacted with the Sports Zone in a couple of minutes meaning that you are not in danger of music, voices or theme tunes being stuck in your head for hours on end. Thank you so much for this Little Tikes! 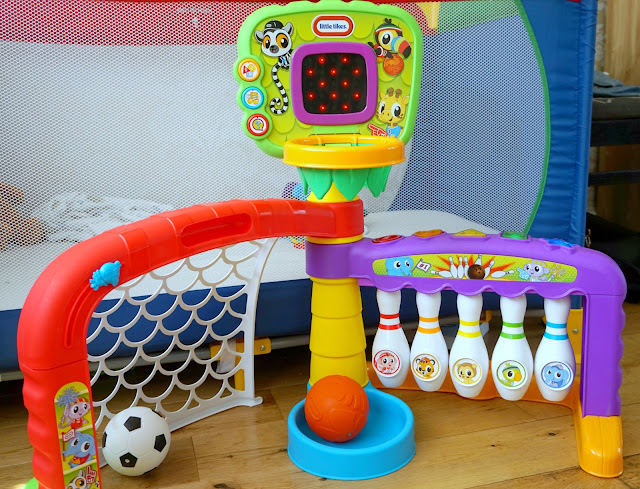 I think the Little Tikes Light 'n' Go 3-in-1 Sports Zone is going to be a big hit over the summer and beyond. It is lightweight and durable enough to be used inside or out (weather depending) and has a height adjustment setting so that it can grow with your child. 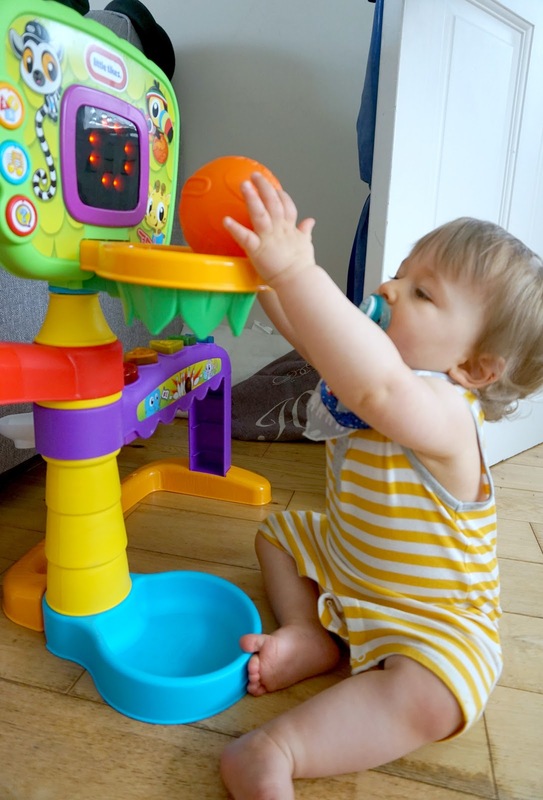 The interactive features also mean that as Eric's understanding grows, so will what he gets out of playing with the toy. 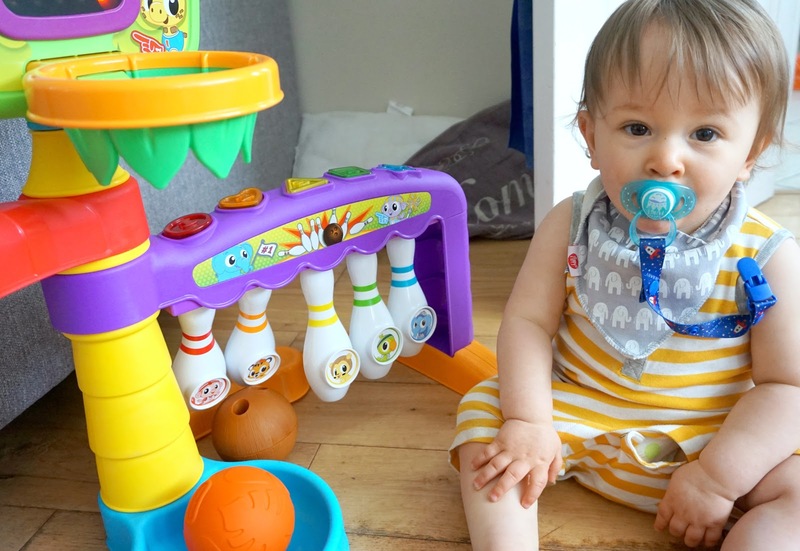 Does your little one have anything from Little Tikes? Let me know your recommendations in the comments. * I was very kindly gifted the Little Tikes 3-in-1 Sports Zone to review. This does not affect my opinions. For more information, please see my disclaimer.